Austin C. Smith was born in Truth, Arkansas, a small community in Madison County on July 5, 1924. His parents were Jasper Franklin Smith and Nancy Suzanne Harline Smith. Austin was the oldest of four children. The Smith family’s home and farm was in a rural area of Madison County and upon completing high school at Huntsville Vocational School , Austin wrote a poem to his mother explaining that he did not want to farm and had ambitions to lead a different life. He joined the Army Air Corps and served in the Philippines during WWII. When returning home he attended the University of Arkansas as a pre med student. In 1948 he married Margaret L. King. The union lasted until his death 56 years later. The couple had 2 children, a son and a daughter. Austin Smith enrolled in the University of Arkansas Medical School in1948 and graduated in 1952. He was a member of the Phi Chi Fraternity, a medical honorary society. After graduation he again enlisted in the U.S. Air Force where he completed an internship of two years at Valley Forge Hospital in Pennsylvania. Feeling an urge to return to his roots, Dr. Smith came back to Huntsville to set up his medical practice. His clinic was opened as part of the old Maternity Hospital in Madison County. Gradually as the Clinic responsibilities grew, Dr. Ivan Box joined him in practice. Together, in 1960 they reopened the closed hospital and built a nursing home. Later a second physician, Dr. Robert Wilson came and eventually a new hospital was built in 1981. As a businessman Dr. Smith built the Cross Bow Restaurant. .Dr. Smith was active in the community from the time he returned from military service. He supported the Huntsville High School football team and became the team’s physician without pay, continuing this service until he retired in 1985. He served on the City Council, was active in the Chamber of Commerce, and other community activities, was a member of Masonic Lodge No.364 and of the Presbyterian Church. He was also an ardent fisherman. In 1985 Dr. Smith suffered a stroke, necessitating retirement. In all this time he had missed only 3 days of work having served 31 years as Huntsville’s leading physician. 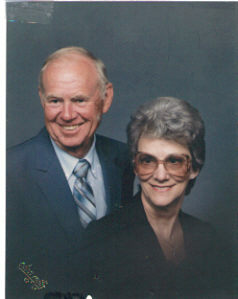 In 1993 Dr. Smith received recognition as Outstanding Citizen from the Chamber of Commerce and he and Mrs. Smith were honored as Grand Marshals in the Christmas parade. Earlier the Hospital Auxiliary presented him with a Service Award. Several Letters to the Editor before and after his death spoke of his personal interest in his patients, his compassion, his home visits, the love for the people he served and his long time support of the high school football team, often slipping money into the coach’s pocket to buy shoes for a player. Dr. Smith died on July 6, 2002. A memorial scholarship was set up in his honor.